Jeremy Hellickson still remains the Phillies player most likely on the move prior to today's trade deadline. The trade deadline arrives in three hours and the rebuilding Phillies haven’t made a deal in exactly two months, when they acquired utility player Jimmy Paredes from the Toronto Blue Jays. And that was an organizational filler addition, not a deal that was going to move the needle on the rebuild. But is it actually possible that the Paredes addition will be the only trade the Phillies will have made between June 1 and the arrival of the deadline at 4 p.m. this afternoon? 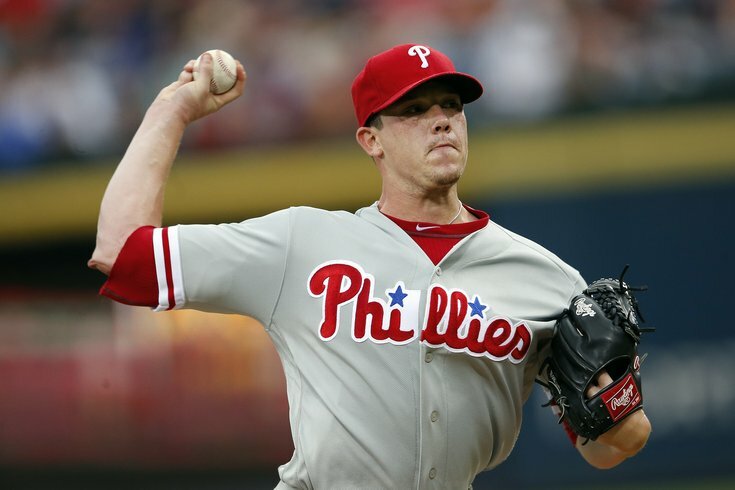 The Phillies will find a taker for free-agent-to-be Jeremy Hellickson. He will not fetch any team’s top prospect, but the educated guess here is the Phillies will certainly get a useful, advanced prospect in return for the dependable 29-year-old righthander. 1. Could the Phillies hold onto Hellickson? Sure. The logic on keeping Hellickson for the remainder of the 2016 season goes like this: you let him anchor your young rotation for August and September, and then make him a qualifying offer after he becomes a free agent this winter. And then when he doesn’t accept the qualifying offer and seeks a multi-year deal elsewhere, the Phillies receive the compensatory draft pick (between the first and second rounds of the 2017 draft). That sounds like an attractive alternative, right? Possibly. But what if Hellickson accepts that qualifying offer, which is expected to be $16.7 million? That’s a pretty handsome salary, a figure that’s more than twice as large as Hellickson’s 2016 salary ($7 million). Of course, it’s very possible Hellickson, represented by Scott Boras, will get a multi-year deal worth more than $16.7 (even if he’s offered no more than, say, 3 years-$30 million, that’s almost twice as much guaranteed money). And if you look at the list of free agent starters this winter (it's not pretty), he should get at least that. But, what if Hellickson falters in the next two months, and goes back to pitching like he did in 2014 and 2015? (Or worse: he gets hurt). If Hellickson is mediocre or terrible in August and September, then that $16.7 million might look pretty attractive for 2017, and Boras can take him back on the open market as a 30-year-old the following winter. So bet on the Phillies cashing in what they can for Hellickson in the next three hours. Even if the best they can get is a team’s top 10 prospect who is in A-ball, that’s a prospect that’s further along (and thus, with more certainty) than whatever player they would select with that compensatory pick next June. 2. Vince Velasquez? Really? Sure, it was more than a little shocking to see Vince Velasquez’s name as the one generating the most buzz among Phillies players heading into the weekend prior to the deadline. But just because teams are talking doesn’t mean a deal is imminent. From the Phillies end, they wouldn’t be doing their jobs properly if they were not assessing the value of all of their players (and top prospects) throughout the year. The Ken Giles trade is a prime example. As a young, talented, and under team control closer, Giles didn’t seem like an obvious guy to trade, but when the value in return is what the Astros said it was, you most certainly consider it. What’s Velasquez’s value as a 24-year old power pitcher who is under club control for the next 5 1/2 seasons? You’d have to imagine the Phillies would get at least two to three very nice pieces back, and if it’s the Texas Rangers you’re dealing with, you’re talking Joey Gallo (who looks like an Adam Dunn-type, which would probably play well at power hitter-friendly Citizens Bank Park) or Jurickson Profar (the top prospect in all of baseball just three years ago, and, at 23, a guy you could probably put at second base for the next decade and be very happy). But you’re probably not getting both of those players for Velasquez, who while very talented, isn’t an established MLB starter yet in that he hasn’t proven to be durable over a full season yet. From the Rangers end, news that you’re talking to the Phillies about Velasquez could also be a leverage tool to facilitate other trades. If given the choice, the Rangers would take Chris Sale or Chris Archer over Velasquez, obviously. So if the White Sox or Rays were interested in Gallo, Profar, or any of the other Rangers prospects in an effort to maximize the return for their own pitcher, hearing that Texas is involved in another deal could make them move quicker. And Sale, given his talent as one of the game’s top five pitchers and his salary, arguably the most team-friendly contract in baseball, should be able to fetch both Profar and Gallo, and very likely more, too. 3. It’s not over after today. Yes, the trade deadline expires at 4 p.m. EST. No, teams are not paralyzed from making deals after 4 p.m. today. The Phillies traded Chase Utley after the deadline last August, traded Joe Blanton in August of 2012, traded Roberto Hernandez (for two useful prospects in Jesmuel Valentin and Victor Arano) two years ago in August, and acquired the likes of Jamie Moyer, Scott Eyre, Mike Sweeney, and Matt Stairs after the July 31 deadline in the last 10 years. As long as players pass through waivers, they can be traded in the next month, and if they’re acquired before Sept. 1, those players are also eligible for their new team’s postseason roster. So even if they don’t change uniforms today, players like Carlos Ruiz and David Hernandez (and Hellickson) can still be moved in the next month.